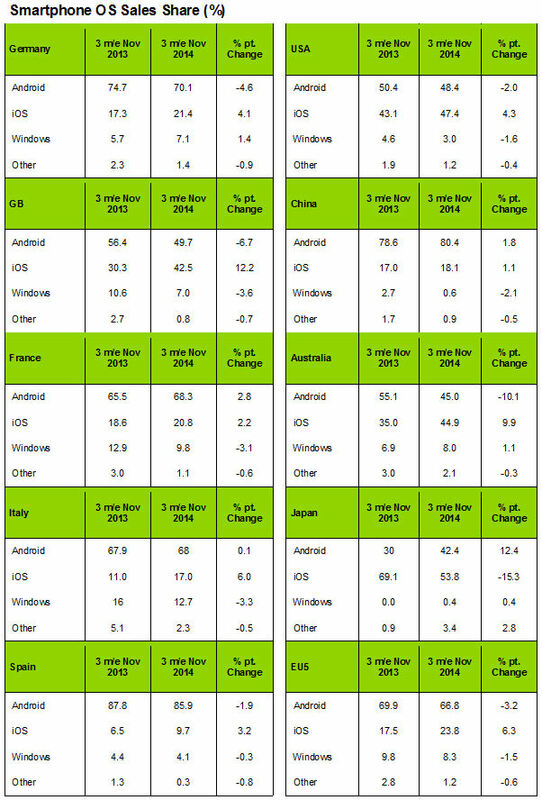 Smartphone sales data covering the three months to the end of November 2014 from Kantar show the iPhone’s iOS platform gained share in nearly all regions covered. Britain and Australia experienced especially strong iPhone growth, with Japan continuing to be the only market tracked where iPhone share is declining. These trends are broadly consistent with those observed last month, indicating a positive reaction to the new iPhone 6s, although the rate of share growth in Australia has increased significantly. The biggest change from a month ago is iPhone share growth in the US. Last month Apple’s share of the US smartphone market grew by less than a percentage point year-on-year, this time it jumped by four percentage point and is heading back to the heady days of 50% share in its home market. Android, as the global market leader, contribute much of the share claimed by iOS, but Microsoft still managed to lose a significant chunk of what little share Windows Phone still has, despite climbing off the floor in Japan.